When we deal with Heavy/Power Metal, the first country name that comes to our minds is from Italy. Yes, Italy, the land that in the 80’s, had just few names on Metal, but since the coming of RHAPSODY OF FIRE in the end of the 90’s, it caused an outburst of Italian bands. Yes, Italy is well known for its tradition in Heavy/Power Metal, and now, even with the style not being in evidence as some years ago, another fine name comes from Angera region: MY REFUGE. 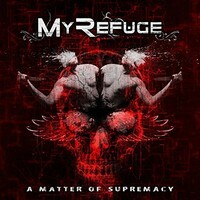 And their first album, "A Matter of Supremacy", is excellent. Not extremely orchestral or grandiose as many bands from the style, and not using only fast tempos and double bass on drums constantly, they prefer an insight where the melodies are excellent, but the aggressive side of their music is evident as well. It reminds a bit the earlier album from BLIND GUARDIAN, but without being a clone. And their songs really can get us by the ears, and become an addiction, due the good use of their instrumental work.. It is heavy and with good level of technique, but the band sounds as a unit, not as a work where someone must appear the most. No, all of them are doing fine, and their music is full of energy and personality. The production was done in a very good way, creating a sound quality that is clear, as a band from the style needs, but of course it has great quantities of a heavy weight. Yes, weight, because their work needs it to exist. It's an essential part of their musical work. The album is extremely homogeneous, but we can point to the excellent "A Storm is Coming" (worked perfectly, having very good guitars, fine vocals and an excellent chorus), the melodic and thundering "The Cage" (with a fine rhythmic basis created by bass guitar and drums, along with great backing vocals and fine guitar duets), the fine storm of riffs called "This Wall", and the thundering "On Wings of Wax". This band is excellent, and their work has the tendency to become great in a near future.